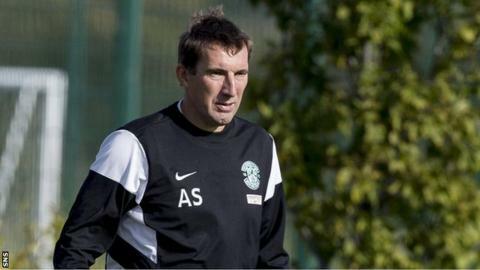 Manager Alan Stubbs admits the Hibernian players have taken longer than he expected to adapt to playing in the Championship following relegation. With three wins and a draw in their eight matches, the Leith side sit fifth in the table, 12 points behind league leaders and Edinburgh rivals Hearts. "Going to grounds like Alloa, it's been a wake-up call for some players." Hibs, under Terry Butcher, lost their two-legged play-off against Hamilton in May and dropped into the second tier. Their results with Stubbs at the helm have been mixed but have improved in recent weeks. The Englishman points out that, since he took over, the team has lost only one game at Easter Road. That defeat came against Falkirk on 23 August, only four games into his tenure and followed a derby defeat by Hearts at Tynecastle. Since then, at home they have beaten Dumbarton 3-2 in the Scottish League Cup, beaten Cowdenbeath and drawn with Raith Rovers. Last month they enjoyed a 2-0 win over Ross County in the League Cup third round and beat Rangers 3-1 in the league at Ibrox. "I want Easter Road to be an intimidating place to play," Stubbs told BBC Scotland ahead of Dumbarton's visit on Saturday. "You have to deal with that as the home team, not just the away team. There can sometimes be tension in the air but football has been like that for the last 40 or 50 years. "When you're at home you're expected to win. When you don't, the fans can get frustrated. "In the Premiership you're used to going to big grounds in the Premiership and suddenly when you go to the smaller clubs, and that is not meant disrespectfully, it takes a different mentality. "You have to be able to defend set pieces and crosses and defend like your life depends on it and then you're hoping your quality gets you through. "Maybe we haven't done that as well as we would have expected." The former Everton coach said it was "disappointing" that Hibs and Dumbarton could not agree on an alternative time for their Championship match on Saturday, with kick-off merely two hours before Scotland play Georgia at Ibrox. With their League Cup encounter against the Sons of the Rock fresh in his mind, Stubbs expects another difficult match. "When they came in the cup they found themselves in the lead, they sat in and tried to frustrate us and they hit us with a couple of set pieces," he said. "We've got to be aware of that, we'll give them the utmost respect. They need to know they are in for a game. We have to put our chances away." The former Motherwell, Cardiff and Doncaster defender Paul Quinn has been training with Hibs recently, with Stubbs keen to sign the out-of-contract 29-year-old. "He's been here for a few days now and he's trained and we're hopeful that we can come to some sort of agreement," said the manager.